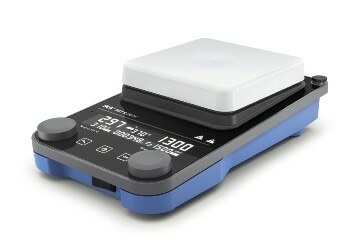 The IKA plate (RCT digital), as well as the RCT 5 digital and RCT digital white magnetic stirrers now offer significantly higher performance, with 800 W power and a range of different set-up plates. As a result, the RCT digital series are the ideal team for a wide range of stirring tasks. The stirring process can be programmed individually from beginning to end for each of the three models, with options for timer functions, rotation direction or sequence programming. Due to this, reactions can run safely and reliably even without monitoring. For the RCT 5 digital, the set-up plate is a coated white ceramic with an angular shape, resulting in improved space maximization.